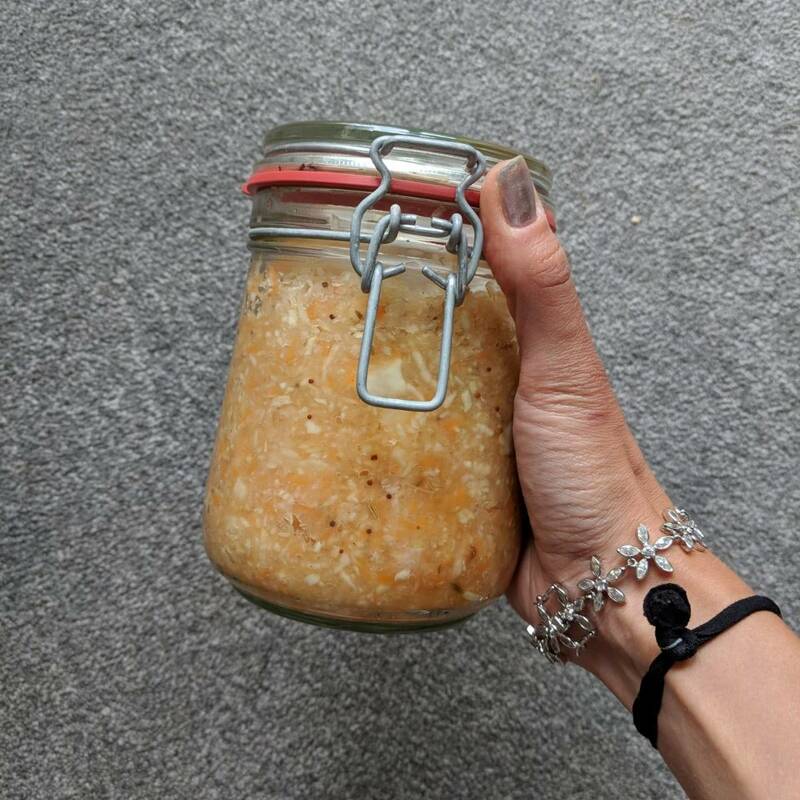 Fermented foods are hip and much older than hipsters. Long before we knew what kimchi was and before they started selling kefir for £3.50 in Waitrose my Great Auntie Gertraud would give me sauerkraut. Fermented, sliced cabbage is a stalwart of Bavarian cuisine but now it has a top knot, a beard and all the Instagram influencers are adding it to their buddha bowls. I’m not a chef, nutritionist, scientist (you’ve got Amy for that) or even an influencer. I can’t tell you about the health benefits of fermented foods or how some old cabbage will cure all your ills. 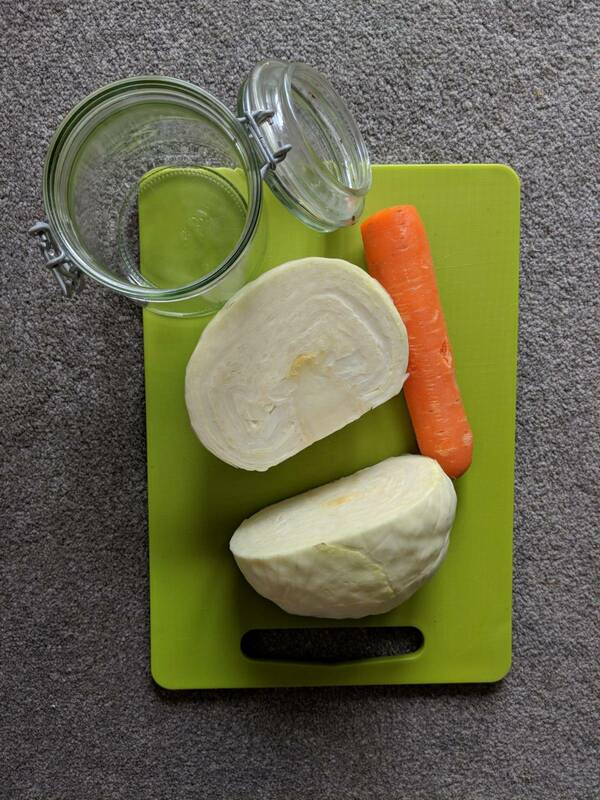 What I can tell you is that I love sauerkraut and when I realised you could make it for about 60p plus the cost of two jars, I stopped scouring the Polish section in Tesco and started whipping up a batch over winter when I got (another) cabbage in my veg box. 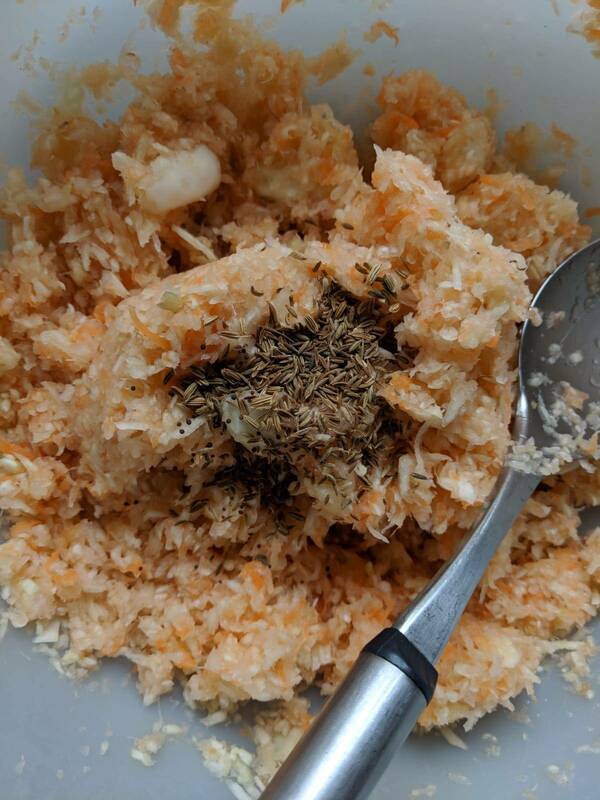 Whether you like the tang, the umami or you’ve got a good article on fermented foods and gut health (please share, any excuse to eat more is good in my book) or you are just curious then here is how I make my sauerkraut. This is going to be the most slapdash recipe you may ever read. 1. 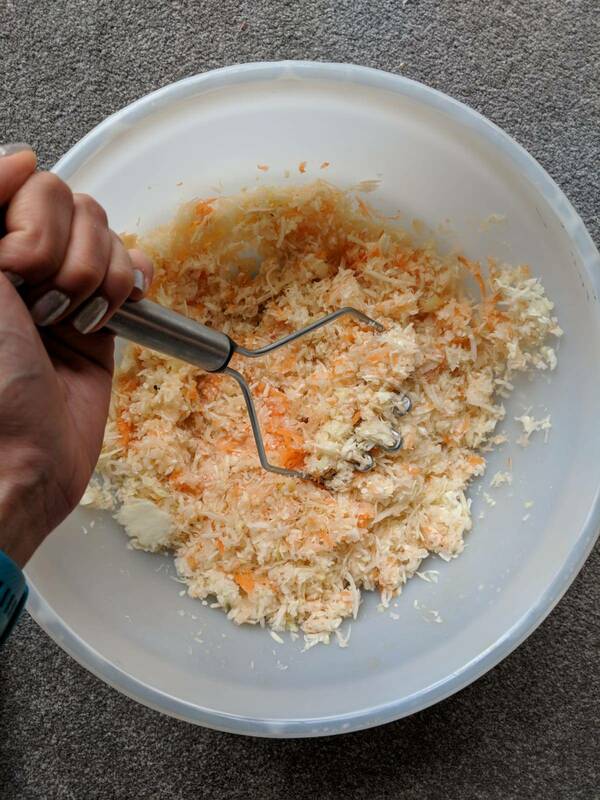 Cut your cabbage (and other veggies if applicable), your options are as follows – I normally chop mine, but I decided to use the food processor this time and I kind of regret it. I like a chunkier-chop and the mixture of sizes. The smaller grate makes it juice up easier though. I’d recommend chopping by hand (it doesn’t take that long) or using a mandolin (mind your fingers). Whichever way you choose, roughly chop your cabbage. You’ve got to get it in your jar, so large slices won’t work. 2. Add the salt. Place the cabbage (and other veggies if applicable) in a large bowl (larger than you think) and add about 1.5 tsp per 500g, I do this by eye, you can check the flavour later and add more salt, or add more if it doesn’t juice up. start to get juicy. That’s it you are ready! 4. Spice. 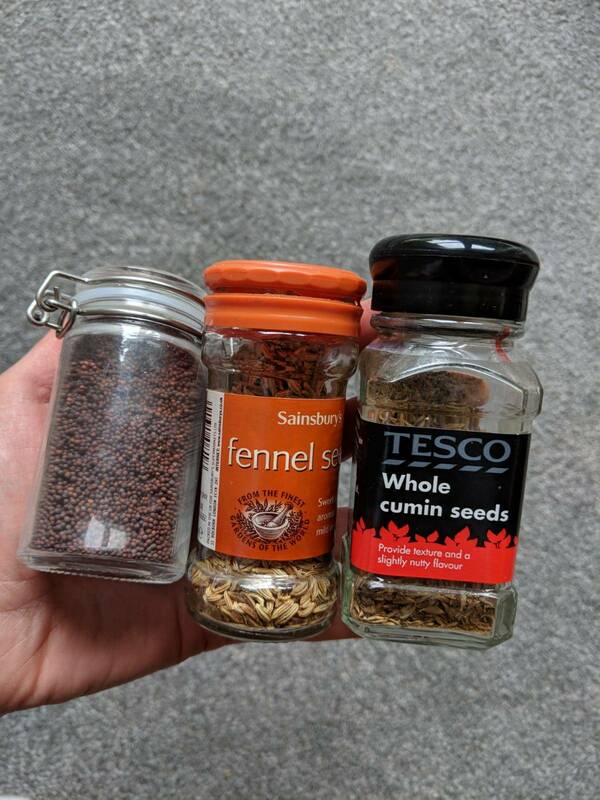 Super SUPER slapdash, each time i make a batch I chuck in some tsps of whatever whole seed-type-spices I have. Don’t use ground, you want to to be fragranced gently with the spices and they’ll fall apart during the fermentation. I like a bit of fennel and cumin, but choose your own adventure or go au-naturel. 5. Taste, give it a little taste, if it tastes like wet cabbage add a little more salt, you don’t want it to taste salty, but it needs enough to get the juices flowing, literally. 6. Jar. Grab your sterilised jars and add the juicy cabbage mixture squeezing down as you go, only fill them ¾ full. They need room for more liquid to osmosis-ize. Weight the cabbage down so it sits under the juicy layer e.g. top with rocks wrapped in greaseproof or a mini glass jar filled with water. 7. Breathe. A deep breath for you and then your kilner jars need to breathe everyday for about two weeks. Keep the jars in a cool place, out of direct sunlight and every day, open the seal, push down the weight and reseal. Your fermentation is under way! 8. Wait, after your two weeks are up, you can move your sauerkraut to the fridge, it no longer needs to breathe everyday, but maybe show it some love occasionally. You can start eating it already, but it gets better with age, keep tasting and see how fermented you like your kraut!